Unless you’ve been living in a bubble, you're probs aware that our planet is…well, look, we haven’t exactly been treating it great. The possibility of a scary-looking future is beginning to feel way too real, and a lot of people are looking to switch up their lifestyle. One of the big baddies on the environmental front is single-use plastic. It can take up to 1000 years to break down, aka 1000 years clogging our landfills (and penguins and dolphins). And it’s used bloody everywhere. Rhianna Knight, founder of sustainable activewear brand Mister Timbuktu, is doing her bit to help. 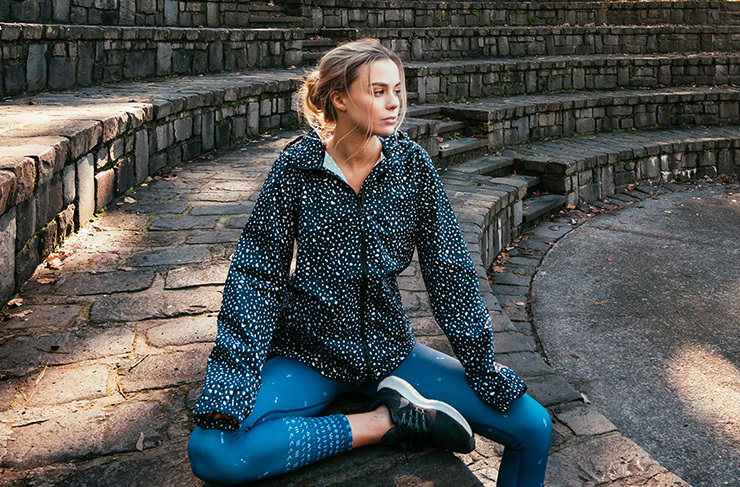 Mister Timbuktu is a line of activewear, leggings and crops, and raincoats, all made from recycled single-use plastic bottles, discarded fishing nets and other ocean nasties. As well as giving new life to what would otherwise be floating fish traps, these materials also require less energy and resources to produce than conventional materials. Double win. Mister Timbuktu want to cover all the bases when it comes to making sustainable products, and we reckon they’ve pretty much nailed it: their clothes are all made in sustainable and safe facilities, their packaging vetos individually wrapping clothes in plastic (why does everyone do that, anyway?) and 20% of their profits go back to Australian charities. Places like Waves of Wellness, which uses surf therapy and education to help those facing mental health challenges, and The Foundation of National Parks and Wildlife, which backs conservation products to help us protect our stunning country. Of course, we’re pretty happy that the clothes themselves are going to give our Instagram #fitspo hashtag some more hype. Quirky, delicate patterns, like the astrology print, on stretchy and comfy fabric. We promise they don’t feel like plastic. More like a second skin. A second skin that (if you live south of the Yarra) will look fantastic at brunch. Oh, and one more thing that’s sure to get all you online shopping aficionados frothing. It's FREE shipping in Australia (check out their online store for the latest collections). We're so on board with these guys it's scary. Read more about Mister Timbuktu on their website. Love shopping? Did you hear Meraki Thread Co. has just opened at The Wharf.